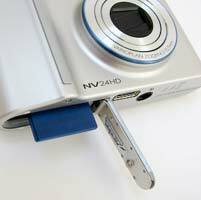 The Samsung NV24HD is a new 10 megapixel compact digital camera that has quite a few tricks up its metaphorical sleeve. There's an impressive 24mm ultra-wide angle, image stabilised 3.6x zoom lens, which is currently the widest offered by any digicam, with a maximum telephoto setting of 86.5mm. Just like the Panasonic Lumix DMC-TZ5 that we recently reviewed, the NV24HD offers a 720p, 16:9 ratio HD video mode, which can shoot 1280x720 pixel video at 30fps. As with the rest of the NV range, the NV24HD employs the same unique, Smart Touch interface, which completely does away with the traditional camera menu system. New features include Auto Contrast Balance, which compensates for backlit conditions, Smile Shot, Blink Detection, Self portrait mode and a Photo Style Selector control dial with 7 types of photo style effects. A 2.5 inch OLED screen, Face Detection, ISO range of 80-3200, and full manual shooting mode for the more experienced photographer complete the headline specifications. 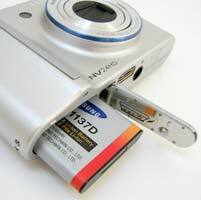 So the Samsung NV24HD certainly offers a lot on paper, but is it the ultimate point-and-shoot digital camera? At one time you wouldn't readily have considered the Samsung brand for a stills camera, but it has achieved considerable mass market success � probably due more to a carpet bombing of competitively priced product than technological breakthroughs or sterling performance. And I have to admit to at first disliking the NV range's unique feature in the piano key-like Smart Touch Interface that does away with regular folder-based menu screens. Not because I'm a traditionalist, but because the minimalist unmarked 'keys' arrangement has always seemed less a practicality, more a fiddly gimmick. But I'm either getting used to it or softening with age as the 10.2 megapixel Samsung NV24HD's operational quirk didn't annoy me as much as its similarly designed predecessors, the at-once futuristic and retro 'style' of our silver review model suggesting the �250 NV24HD wouldn't be out of place in an episode of Gerry Anderson-era Captain Scarlet. There's also the curious and rather cute Roberts radio-like 'knob twiddling' the NV24HD allows users to indulge in; with a recessed mode dial top left of the camera affording instant access to eight funky if inessential in-camera 'photo style' effects, in addition to a more run-of-the-mill shooting dial on the right. All of which are distractions from what Samsung is calling its first High Definition stills camera, capable of recording 1280x720 pixels, 30fps video clips with sound that utilize the new H.264 compression technology to avoid clogging up your SD card. Admittedly that's a higher video resolution than the typical 640x480 pixels offered by competitors in the NV24HD's class, but, under the weight of HD hype, let's not forget that 1280x720 still equates to less than one megapixel. Take a look at our sample clip later to gauge what the quality's like, and bear in mind that larger file sizes can mean video occasionally 'stutters' when played back on your desktop. While a USB connection is provided, it seems rather unfair though that, as with Sony's HD Cyber-shots, users have to pay extra for an HDMI (High Definition Media Interface) cable to hook the camera up to an HDTV set. A remote control is similarly available, but again as an optional extra. As it is, regular AV cabling is provided out of the box for reviewing footage on standard definition TVs, slightly defeating the NV24HD's stated purpose. But there are some useful features for the stills photographer, namely a wider than average (at 24mm) lens (up to a less impressive maximum telephoto reach of 86.5mm), and, as bright sunshine uncharacteristically reigned for most of our test period, the anti-glare AM-OLED technology of the 2.5-inch rear LCD � the brightness of which alters depending on ambient light levels � came in handy in the absence of an optical viewfinder. Once again optical image stabilisation is paired with less effective digital image stabilization and dressed up as 'dual' image stabilization, an apparent breakthrough in the war against camera shake, and has its own setting on the shooting mode dial. Further hand holding features on the Samsung NV24HD include the now ubiquitous face detection, smile shot (like Sony's smile shutter, the shutter is fired automatically when your subject grins), plus blink detection, a feature by which the camera takes three image in quick succession if it detects fluttering eyelids. Moreover, as well as, or perhaps in spite of, such gimmicks, the NV24HD feels reassuringly well built and solid, its mainly metal construction a cut above the norm, especially with supplied lithium ion rechargeable pack and optional SD card inserted. So let's take a quick tour around the rest of this minimalist camera. With the front dominated by that aforementioned lens slap bang in the middle, the fact that the flash is top mounted and of the pop up variety keeps the sight lines clean, with just two round windows hovering above the lens barrel like Mickey Mouse's ears. The left of these windows houses a sensor for that optional remote control, adjacent to which is a tiny, almost hidden self-timer lamp at the top of a thin rubber strip. This strip, slender as it is, provides a degree of purchase when gripping the camera. The window on the right meanwhile houses the AF sensor. Moving to the top of the Samsung NV24HD we find the central controls book-ended by that 'photo style' dial on the left and a shooting mode dial on the right. The photo style effects include the self-explanatory 'normal' which we utilised as our default setting, 'soft', vivid, the intriguing 'forest' � employed for a trip around Wisley Gardens in Surrey � plus retro, 'cool', the equally intriguing 'calm' (providing a faded colour postcard look), and finally classic, which translates as black and white. Next to this left-hand dial is the pop-up flash, which, unlike those featured on bridge cameras, is unable to be manually activated. Moving further to the right we discover a neatly recessed power button that glows with a cool blue light when the camera is active, slightly forward of which is a springy and tactile shutter release button. This means it's easy to determine the half way point, thus confirming focus and exposure before firing off a shot. The Samsung NV24HD is furthermore quick to power up, the lens barrel darting out from storage flush to the body in around a second or so, while the rear LCD bursts into life. Once focus and exposure has been determined, any shutter delay is imperceptible, maximum resolution images being committed to memory in around two seconds, the screen blanking out momentarily. Lastly for the camera top, we reach the more familiar mode dial. This features full auto, program and manual options, along with those HD movie clips, a dedicated portrait and night shot mode, plus access to further scene modes (this is where you'll find smile shot and blink detection) plus a special setting to activate dual IS. Incidentally, give either the photo style mode wheel or its opposite shooting mode wheel a twist and a virtual version handily pops up on screen, saving you having to take your eye away from whatever composition you're in the process of lining up. Apart from the dark pool of an LCD centrally located on the NV24HD's back, surrounded by those controversial 'smart touch' keys, the camera's rear is a similarly pared down affair; those two key features are joined only by a miniscule camera status lamp top right plus an eyelet for the supplied camera strap far right. Not forgetting a thin sliver of a zoom lever of course. The zoom itself is very quick to respond. I mentioned earlier that the interface keys are largely unmarked. Two in fact are; one, in the bottom right hand corner displaying the familiar play symbol for accessing image review mode, and the other, immediately above, acting as a means of summoning up optical image stabilization � left on almost constantly for the duration of our review. In auto mode, aside from displaying on screen the number of shots remaining, date and time, photo style and shooting mode, you're presented with a quartet of options alongside the four keys situated parallel with the bottom left of screen. The first switches focus from regular auto capture to macro, the second presents the flash presets � namely auto, off, red eye or auto red eye fix � a third key selects resolution (from one megapixel through to the full ten), while the fourth adjusts AF area from centre to multi, or alternatively switches on face detection and face detection-powered self-portrait modes. Move the shooting dial around to program, meanwhile, and all but one of the remaining 'empty' keys is assigned a specific task. To the first four auto options mentioned are added the ability to switch from single shot to continuous shooting, and next switch metering between the standard centre-weighted, spot or multi-zone. Then, progressing up the right flank of keys, you have the familiar exposure compensation slider (+/- 2EV), ISO speeds, and a choice of manual white balance. 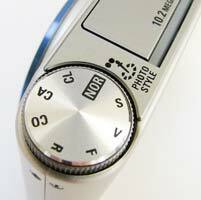 Flick the reassuringly stiff mode wheel a notch further around to manual, and users also get the opportunity to adjust shutter speed and aperture on the fly. Easy to overlook in the excitement, but indicated by an escalator-like symbol hovering over the last but one key to the right of the bottom row, is a means of accessing a second tier of options. This includes JPEG compression levels � normal, fine or super fine � plus self timer options, the ability to add voice memos to selected shots, or, lastly access the Samsung NV24HD's set up mode. I found it easy to slip from one setting to the next so responsive are the keys, so it takes a while for such initially awkward operation to become intuitive. And, if you're coming to the NV24HD from almost any other compact camera � and usually shared operational conventions � a period of familiarization is required. Whether you find searching for controls that normally fall readily to hand exciting or irritating depends on your level of patience. That as may be, the NV24HD is fast and responsive when you find what you're looking for, the screen fares better than most in strong sunlight, and a tilt of the camera to aid viewing is usually as successful as cupping your hand around the screen on other models. Flipping the Samsung NV24HD over and looking at the base, we find a screw thread for your tripod, an adjacent unprotected port for the supplied all-in-one USB and AV plus separate mains power lead (the battery is charged in camera), plus a spring-loaded cover for the joint battery and SD card compartment. 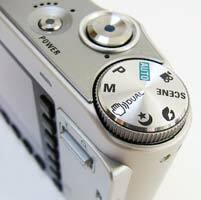 Of course you can't change battery or card without removing the camera from any tripod it may be on. There was perhaps room for a card slot on either of the NV24HD's flanks � as both are bereft of controls - but since 99% of digital compacts share this design oversight, any such grumble feels rather like shouting into the wind. PhotographyBLOG is a member of the DIWA organisation. Our test results for the Samsung NV24HD have been submitted to DIWA for comparison with test results for different samples of the same camera model supplied by other DIWA member sites.